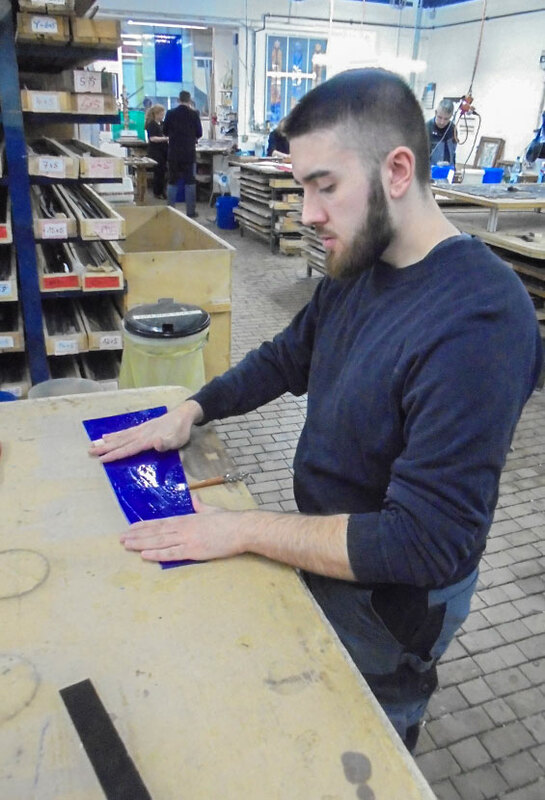 To familiarize our trainees not only with the pleasure but also plenty of practice in the art of glass finishing, at Derix Glasstudios we organized a project week for our trainees early in the year in mid-January. 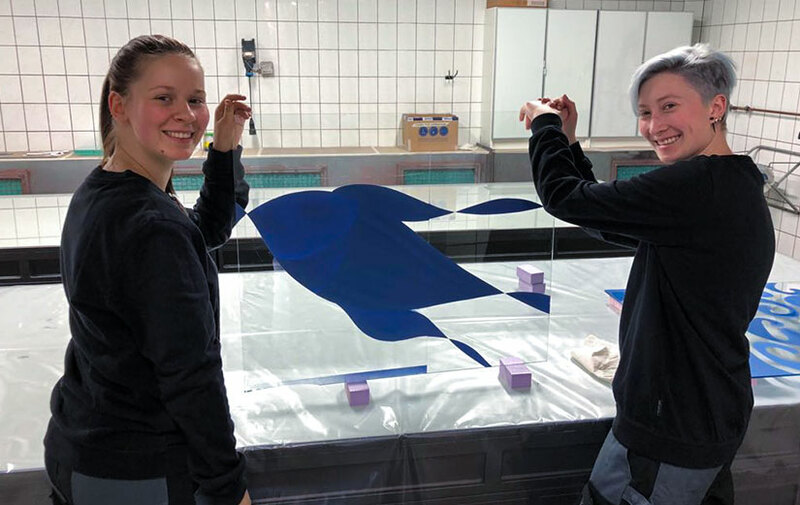 The project was led by our experienced instructors Kerstin Grimm (responsible for the glaziers) and Bärbel Gottschling-Djahandoust (responsible for the glass finishers). 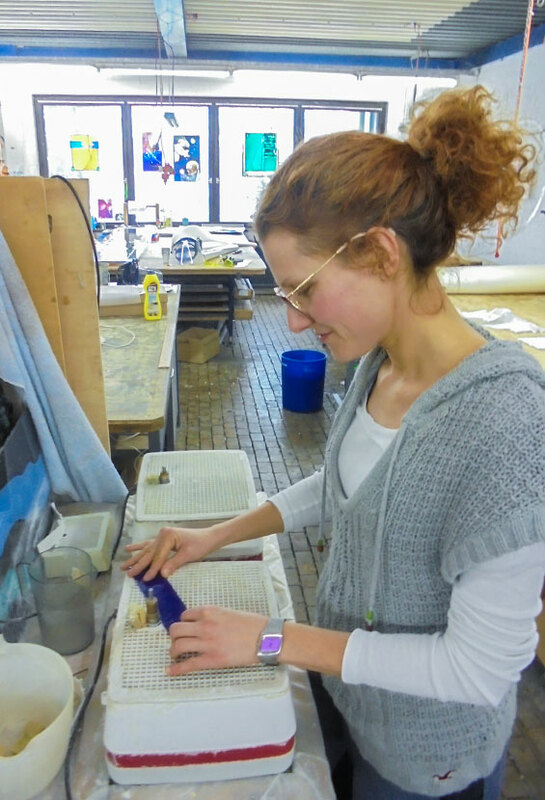 On different days, the total of nine trainees, comprising four glass finishers and five glaziers were able to tackle the work themselves and immerse themselves in the world of glass finishing. 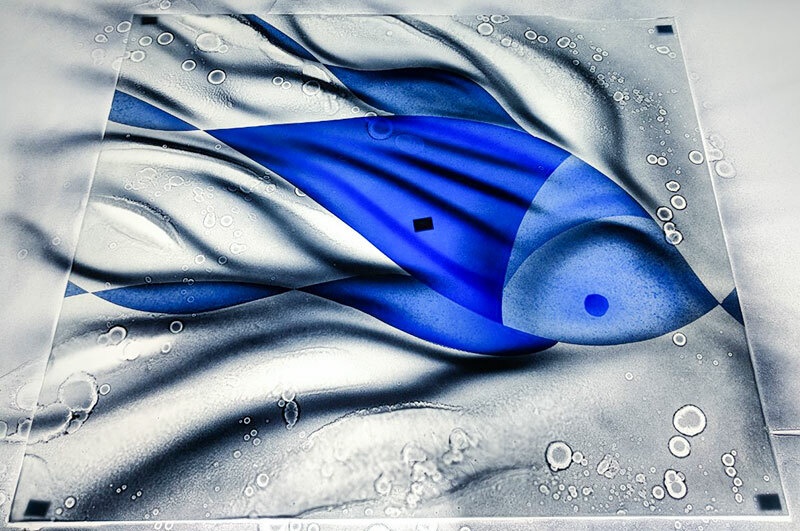 Under the supervision of the two instructors, the participants – equipped with protective clothing and the appropriate tools – were able to experiment with technical methods such as screen printing, airbrush guns and stencils or glass bonding and tackle stimulating tasks involved in glass finishing. All the trainees engaged in the program with great enthusiasm, keen interest and fun. As such, the project constituted a successful week for all those who attended and ensured that our trainees were introduced to the art of glass finishing in a hands-on and enjoyable way. The fact that our trainees repeatedly stand out as state and national winners of competitions held by chambers of crafts and trades is certainly no coincidence. This is because the quality of the work is just as important to us as our enjoyment of it. 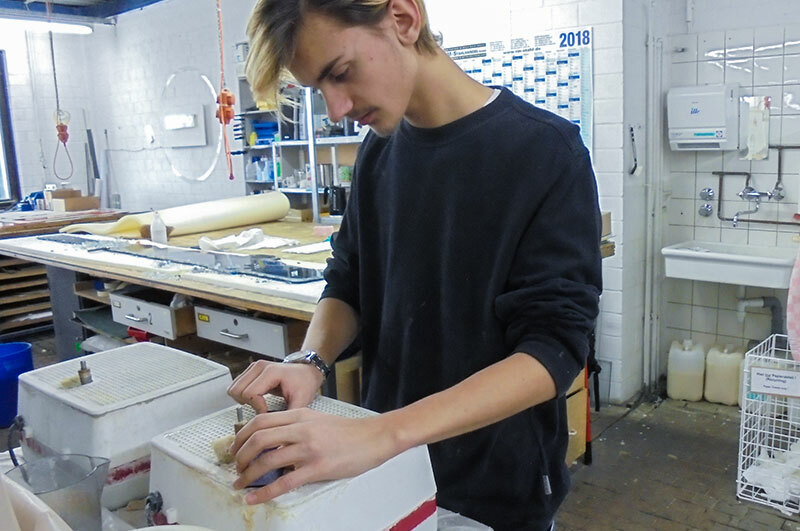 It is why we at Derix Glasstudios are committed specifically to promoting our staff and trainees by means of various programs and projects. Therefore, our first project week will definitely not be the only one. 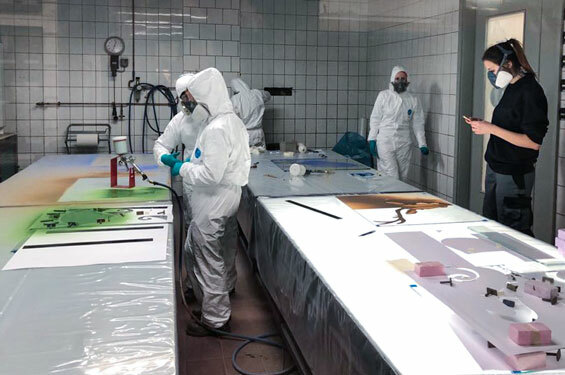 It now forms a new unit within our training program, which will be regularly repeated and represents a major contribution to future quality assurance. 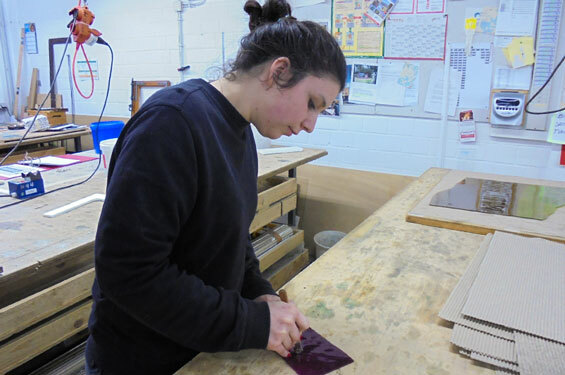 If you would also like to benefit from professional training and effective sponsorship, then why not take this opportunity to apply for an apprenticeship as a glazier or glass finisher. We are always on the lookout for committed new staff members and would be delighted to welcome you to join our highly motivated team. If you have any questions about the vacancies advertised or Derix Glasstudios, please feel free to contact us. 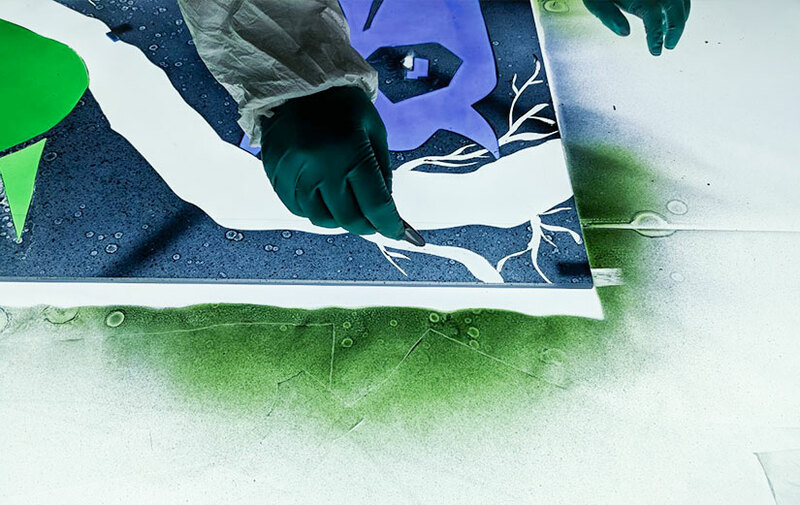 Apply now and let us create some breathtaking artworks of glass together.